An example of love, sacrifice, and loyalty. Paul McCartney wrote this song after a dream in which his mother, whose name was Mary, came to him and spoke the iconic words, “let it be” at a time when the 20-something musician needed words of comfort. The peaceful, calm lyrics and chant-like refrain still soothe, despite the fact that he penned them 47 years ago. Is that because we hear “mother Mary” and think McCartney is singing about the Virgin Mary? Or is it some primordial longing for classic rock spun on vinyl that soothes our aching soul? Certainly, none of us think of Paul McCarney’s mother when we hear this song. 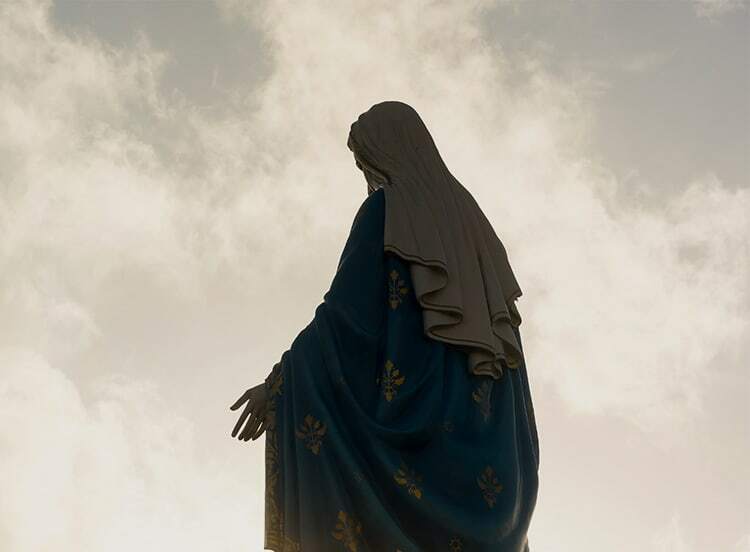 There is something about Mary, the mother of Jesus, that confronts and comforts us in all her red and blue cascading fabric during this season. But what do we do with her? What spiritual relevance might she embody if we aren’t Catholic and don’t dream of crawling on our knees to Portugal’s Shrine of our Lady of Fatima? Bernard of Clairvaux, the 12th-century theologian, spoke a helpful word to those who aren’t ready to take in the full banquet of faith, “If you fear the Father, go to the Son. If you fear the Son, go to the Mother.” Being born of woman, having a mother is one common denominator we all share, yet not all of our mothers were able to take a hands-on role in showing us the way of love. Burdened by boatloads of student loans and unclear job prospects, millennials are known as the “anxious generation.” They have outgrown the comfort of their own mothers’ bandaids, yet a supernatural blanket of protective care might prove a welcome balm in the face of angst and uncertainty. Mary’s Magnificat provides a clarion call which focuses not on the deficits of our own life experiences, but on the greatness of God’s heart. “He has looked upon the humble estate of His servant … He has scattered the proud in the thoughts of their hearts … He has filled the hungry with good things and the rich He has sent away empty” (Luke 1:48-53). Good mothers provide not only comfort and nurturing care, they also take kids to church (Pew Research, 2016). But millennials with divorced parents were more likely to move away from the Christian faith than those whose parents were together in their formative years. They are also more likely to claim no church affiliation (Public Religion Research, 2016). Often referred to as “nones,” this group needs spiritual mothers to guide them. Nones are entering parenthood without a church small group bringing them casseroles or natural mothers on the scene offering to babysit for date nights. The Holy Mother serves as a go-to model of authentic love and sacrifice when these helpful relationships are missing. Even her conduct affirms that it’s OK to make a parenting mistake. “Why were you searching for me? Didn’t you know I’d be in my Father’s house?” (Luke 2:49) Jesus asked His parents this upon their return to Jerusalem, after caravanning home for an entire day before they realized He was gone. The Scriptures reveal precious few details about the breadth of her life, but we do know from the Gospel of Luke that she displayed a radical faith, wisdom and submission to God beyond her years. Experiences are what millennials are seeking, with 71 percent of 18-35 year olds citing “experiences” as the most important thing in their lives (Contiki Travel, 2017). Well, a visitation from the Virgin Mary would rank pretty high on the list of unique experiences and she is reportedly showing up more frequently than ever, particularly in Muslim contexts. Muslims revere Mary. She is mentioned 34 times in the Quran and large numbers of Muslims are making pilgrimages to Christian Marian shrines. Yet, Mary’s encounter with the angel Gabriel marks more than a divine experience. Her submission ushered in the beginning of a lifelong “yes,” a fidelity to her son from annunciation to the cross. Sometimes loyalty and love cost us more than we can imagine, but loyalty strengthens the heart and Advent is the perfect season to receive a holy strengthening. According to millennial career coach Daniel Reynolds, “Millennials are coming to have no faith in the concept of loyalty.” Loyalty is a foundation stone of Advent devotion. Like Mary, we wait. In Advent, we wait for the return of Christ. We prepare the way of the Lord and as we wait, He strengthens the heart. “Wait for the Lord, be strong and let your heart take courage, wait for the Lord” (Psalm 27:14). The greatest work often goes unseen. Imagine if Christ died in our age what Instagram feeds of Mary would look like. Fortunately, Mary’s hidden work of cradling His body from the cross, mourning along the rocky path to Joseph of Arimathaea’s tomb and waiting for the fulfillment of His resurrection are images left to the imagination. The reality of her sacrificial “yes,” her mothering example and submission to God’s call can inspire faith and strengthen the heart of not only millennials, but all who seek the way of love in our broken age. Margaret Philbrick is the author of the novel, A Minor. You can follow her at www.margaretphilbrick.com.